The Japanese may not have invented the art of wrapping, but they have certainly perfected it. 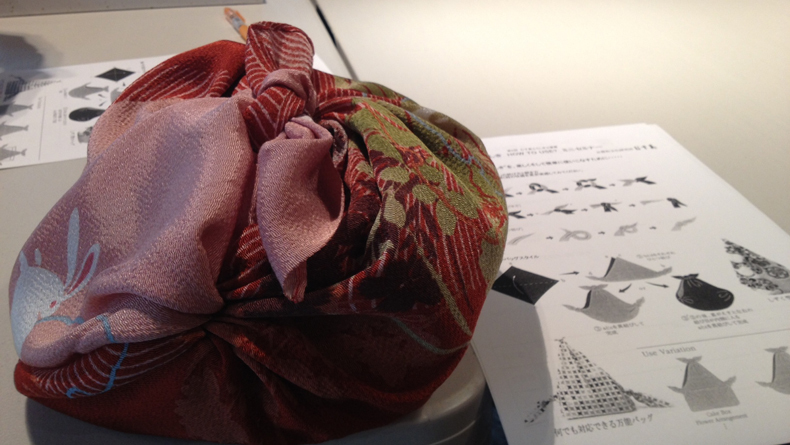 When you swaddle your gift in a furoshiki, the wrap becomes part of the present. A furoshiki is a square piece of cloth decorated with patterns that can be simple or elaborate, intricately traditional or bold and modern. The name comes from its original dual use as a bundle wrap and a floor mat for toting along to public baths. 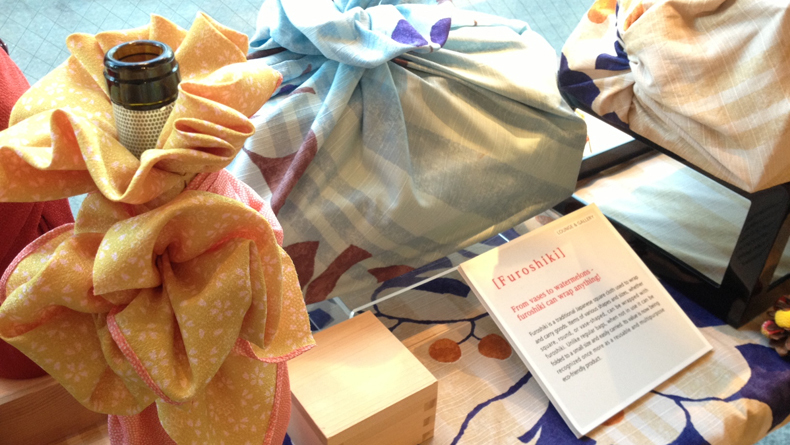 Musubi in Jingumae sells furoshiki in three standard sizes. The largest can be folded, twisted and knotted to make a roomy tote bag or even a child’s backpack. The smallest is perfect for making a nifty carrying sack for a water bottle. Sound complicated? 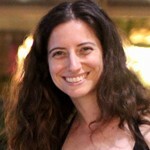 Sit in on a weekend workshop and learn an array of wrapping techniques. 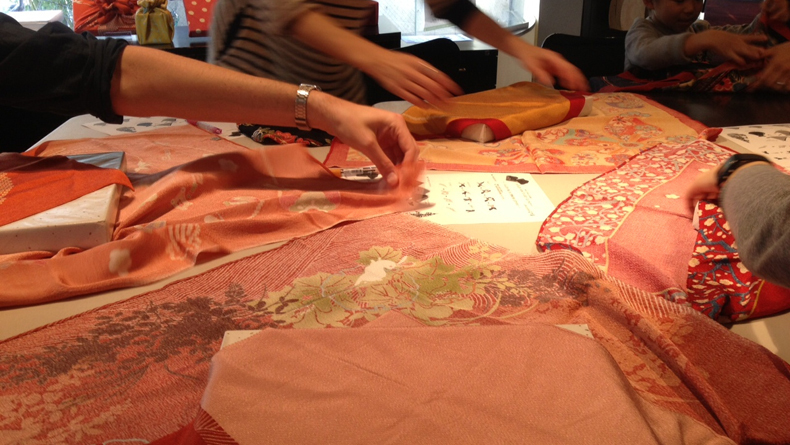 Most workshops are only ¥500, which can then be discounted from any same-day purchase in the shop. A typical class will start with the basic bento box wrap. This is a practical, daily-use way of wrapping and carrying a flat box. Instruction includes details about getting the knot to lie neatly and orienting the cloth to show off its design to the best advantage. Shift the knot to the corner and work some magic with the flaps, and you have a stunningly wrapped present. With a few minor tweaks, the bento wrap can be turned vertically to carry books. You’ll learn how to make a simple tote bag and then how to turn it inside-out and adjust it to make a surprisingly stable cake carrier. I attended a workshop recently with two friends. 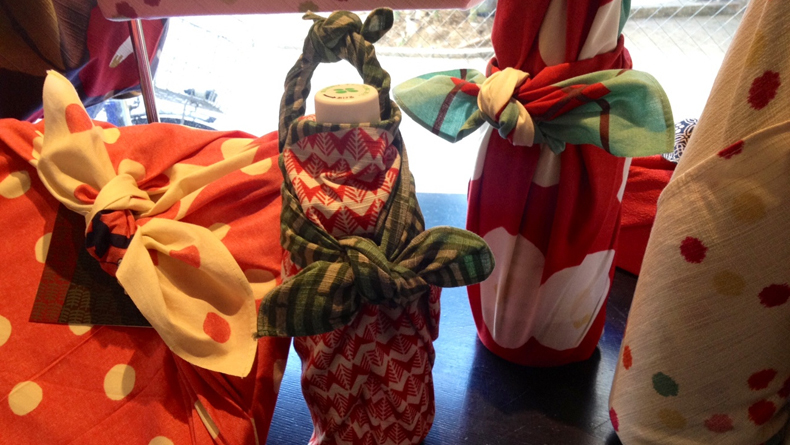 While the children there were busy using their poofy furoshiki bags as soccer balls, we learned to perfect the trick we were most interested in for the holiday season: wrapping wine bottles. We learned how to make a decorative and handy carrying pouch for a single bottle and the classic and elegant double bottle wrap. Bringing either one as a gift would make you the toast of your next holiday party. If you’ve left your holiday shopping and wrapping til the last minute, Musubi has got you covered. The friendly staff will be happy to show you a few wrapping tricks on the spot whenever you stop by the shop. Open: Mon-Fri, 11 a.m.-8 p.m.; Sat-Sun, 11 a.m.-7 p.m.